This charming little book takes all the work out of research and presents you with choice bits of information, facsimiles & transcripts of actual written records and reproductions of artwork from precious original items held by the National Library of Australia. While we go about our daily routine, busy people are working with these items and discovering our history and serving it up in these bite size chunks! Less than 180 pages of text and images give a wonderful flavour of Cook's journeys and the achievements of this talented crew which included Banks and Solander. The portions of transcripts are given background and context so we can understand their significance. 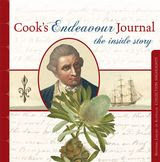 The original journal is available on line as are the transcripts which is terrific for more in depth research but for a small weekend trip on the bark Endeavour, this beautifully designed book is perfect. A luscious new cook book exploring Moroccan cuisine. a brief introduction to Morocco and its cuisine is followed by chapters focusing on a different theme eg Tagines, preserved lemon/limes, pomegranates, salads etc. The chapter starts off with an explanation/recipe for the main theme and then has some yummy recipes. I think I'll try the Caramelised Tomatoes (ingredients include nutmeg, rosewater, pepper, honey, cinnamon and almonds) and then branch out into something more involved. Although the recipes use lots of spices, they don't seem too complicated. The photos certainly look mouth watering. Another fine addition to our wonderful collection of cook books. In 'The Race', Richard North Patterson poses the question 'Can an honest man become president?' but as previous readers of his contemporary political novels will know, it's never that simple. Patterson brings the ambition and drama of a brutal political contest to life with the assurance of a person with inside knowledge of Washington power games. If you liked this one, why not try one of his earlier novels from our Fiction General collection. Bernard Cornwell's masterly recreation of the battle of Agincourt, including the campaign that led up to it is personalised by the focus on Nicholas Hook. Nick has been drawing a bow since he was seven years old, building strength and skill. "Hook had learned the whispering release that let the string slip through his fingers, which hardened into leather pads. and as he drew and released, drew and released, year after year, the muscles of his back, his chest and his arms grew massive. This was one requirement, the huge muscles needed to draw the bow, while the other, which was harder to acquire, was to forget the eye. When he first started as a boy, Hook would draw the cord to his cheek and sight down the arrow's length to aim, but that cheated the bow of its full power. If a bodkin was to shear through plate armour it needed all the power of the yew and that meant drawing the cord to the ear, and then the arrow slanted across the eye, and it had taken Hook years to learn how to think the arrow to the target. He could not explain it, but no archer could. He only knew that when he drew the cord he looked at the target and the arrow flew there because he wanted it to, not because he had lined eye, arrow and target. War in 1415 is brutal and bloody so this book is not for the squeamish. Cornwell's gift for re-telling famous battles and military campaigns evidenced in his works on Wellington (the Sharpe Series) and the American Civil War (the Starbuck Chronicles) is in full flight here. 6,000 Englishmen (including a few Welshmen) beat a French army of 30,000 helped by the weather and the English longbow. Interestingly, as an aside in his historical note at the end of the book, Cornwell theorises that as the French had threatened to cut off two fingers from the archers' hands to prevent them drawing the bow, that the English made rude gestures with those fingers at the French after they won the battle. Thus the origin of the infamous two fingered salute! A recent addition to the Large Print fiction collection, this is an easy read chronicling the life of our heroine after her husband dies in a car accident immediately after announcing he was leaving her. Taking her grief and anger, as well as two small sons, she moves to a small town and takes over a knitting/wool shop. Several improbable story lines involving a movie star and other celebrity friends later, she has rebuilt her life and has a new romance building. Enjoyable fluffy escapism. Have a nice night in with a box of chocolates and a glass (or two) of wine! A lovely new book to browse or to read in more depth. Find out the characteristics of gardens for alchemists, knights, pilgrims, cooks and more! what were the gardens used for in the context of the medieval times and who looked after them. Loaded with planting information and sample designs as well as photos and stories about re-created gardens you can visit (sadly most are in Europe!) as well as information to help you create your own patch of magic. I was impressed to realise that I had a number of well loved plants that would grace a Mary Garden viz carnations, roses, lavender, rosemary etc. The abiding impression is of the tranquility and serenity of a well-tended and designed garden to soothe the senses and uplift the spirit. A mystery with a difference. A woman has a traffic accident and wanders away. she appears dazed and confused and states she is one of 'the Bethany girls'. Two girls who had disappeared thirty years before when they went to the mall. As the mystery deepens, the woman reveals little by little her story. Are we dealing with murder, abuse, runaways and how did the long ago mystery affect the family and friends. A good read in Large Print for mystery devotees.